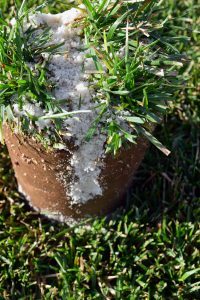 The evacuation of excess moisture is paramount to the success of an athletic field. We know that a field with a small amount of organics or top soil in general tends to be better at binding more nutrients in the rootzone. 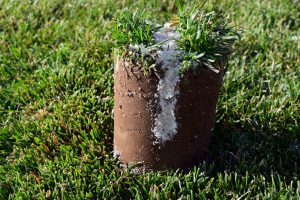 Beyond the ability to retain more nutrients, the presence of native soil in rootzones tends to improve the surface stability. The downside to a field with excess amounts of clay or organic material though is they get compacted easily, they have poor exchange of air and water, and they get water logged in times of excess moisture. The premier athletic field utilizes a gravel blanket and an underdrain system to create a very high quality field. It is hard to beat the outstanding drainage and rootzone that these types of fields provide. The design of these fields provides a uniform medium to establish your field and they remove excess moisture very quickly. These types of fields have few down sides beyond the upfront cost to construct and an increase in the level of maintenance. A couple of points of focus are increases to irrigation and fertilization due to the sand rootzone. Typically, fertilizations have to be increased or the field will require “spoon feeding” due to the rootzones inability to adequately bind the nutrients. It is important to consider the inputs, but this type of natural field is the highest performer in its class. Another option to consider for your facility is a sand slit drain system. The sand slit drainage system does a good job of reducing intense maintenance while still improving a fields drainage capability. It is a happy marriage of the two things because the system can both evacuate the excess moisture from an athletic field, but still utilize native soils that can be easier to maintain when it comes to a natural grass field. This system requires fewer inputs with respect to fertilization and daily irrigation. Sand slit drainage is a functional and an economical way to improve an athletic field that has good planarity, a good variety of turf, and has a native soil rootzone without complete reclamation of the facility. The system is able to whisk away excess water, without drying out the field. Cost wise it is cheaper for the owner to maintain, requires less staff time, and is cheaper to install in the front end. In the end it is the most cost-effective system to move water effectively. This system also cuts down on maintenance because it requires less fertilizer, less irrigation, and less direct maintenance because it doesn’t need to be watered as much and you don’t have to feed it with as much due to leaching through the rootzone. The long-term maintenance of the drainage is easily maintained by having it re-slit after 5-7 years of use. This improves the overall downtime for the facility. The installation time is also significantly quicker since it does not involve total renovation of the existing facility. If this system is installed in May or June, by late July the field is recovered, healed and ready for use. It is about a 2-3-week process to install. The sand slitting process itself only takes a couple of days. The real benefit to the system is you never have to move water more than 10 inches over the surface area to find pore spacing for it to be evacuated. It moves into the sand slits and from the sand slits into the lateral collector lines. The lateral collector lines then drop into a collector line that will either remove it from the field or into a site drain system. 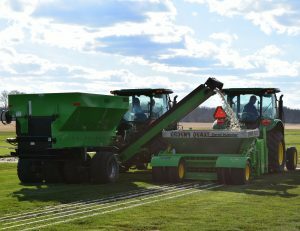 By having this system, the field will be wet with significant rain fall, but not muddy because the excess water will be evacuated from the field. It will do a good job removing moisture in a way that keeps the field playable, even with a major rain event. In return you fields will be able to tolerate heavier wear. In September of 2014, Sports Turf Company installed a sand slit drainage system in Bacon County High School’s football, baseball and softball fields. The school system wanted athletic fields that drained efficiently, but were easily maintainable. The most economical way we saw to do this was through the installation of a sand slit drainage. Sports Turf Company Strives for Athlete Safety What's Hot?